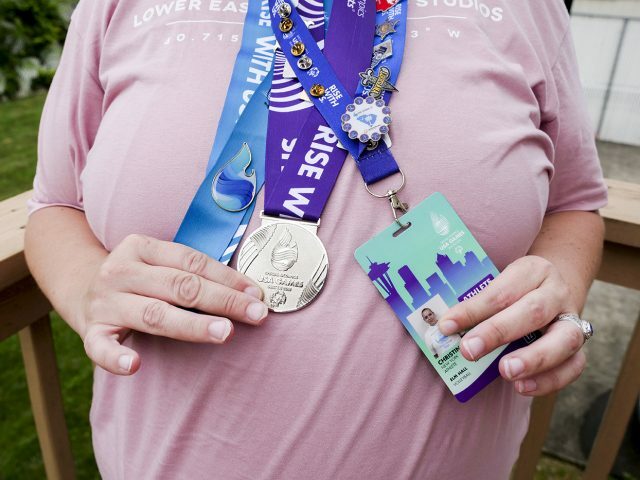 Christina G. placed fifth in the Special Olympics Games in Seattle, Washington this year. Christina, an avid athlete, won her medal as a volleyball player. “I got a lot of good serves in,” said Christina with a smile. In the integrated games, Christina’s team placed second. “We almost made it to Dubai,” she said. Christina said she’ll keep going, so she’s ready for the next competition in two years. It’s not just volleyball that Christina enjoys. She loves basketball, hockey, softball and bowling. She’s getting ready for softball in the fall, playing shortstop. In hockey, she’s plays defense. “I love sports,” Christina shared. “It helps me forget about the past.” Christina said that when she was in high school, coaches didn’t give her a chance to play. 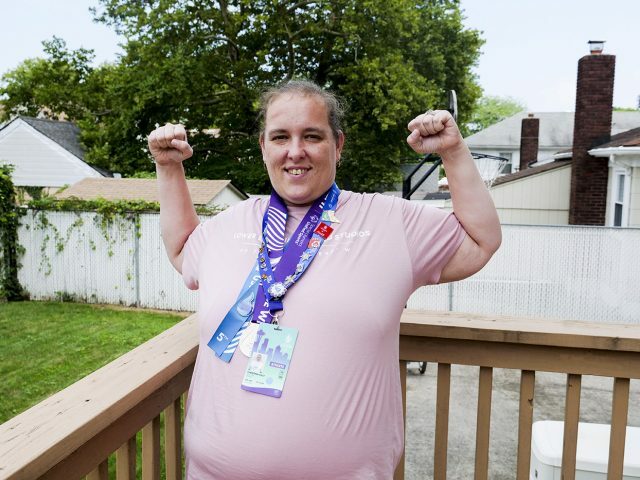 Now, with three award winning ribbons from the 2018 Summer Games under her belt, Christina continues to focus on her future. “I want to work at the nursing home,” said Christina, pointing out the window to the nearby Sunrise Nursing Home. Christina has been on a pre-vocational track, working with a job coach to find a position that fits. “I like spending time with everyone. I help with the activities and keep them company,” said Christina, who hopes to land a part time position there in the coming months. Christina plays competitive sports with the Staten Island agency On Your Mark and has lived at HeartShare’s Scibelli Residence, also on Staten Island, for the past 6 years. She’s called HeartShare her home for about 17 years. Christina also proudly identified as the “best aunt ever,” talking about a t-shirt her sister bought her. Christina coaches her nieces and nephew. “He’s already hitting in t-ball and he’ll be a pro when he’s a little older,” said Christina with a smile.